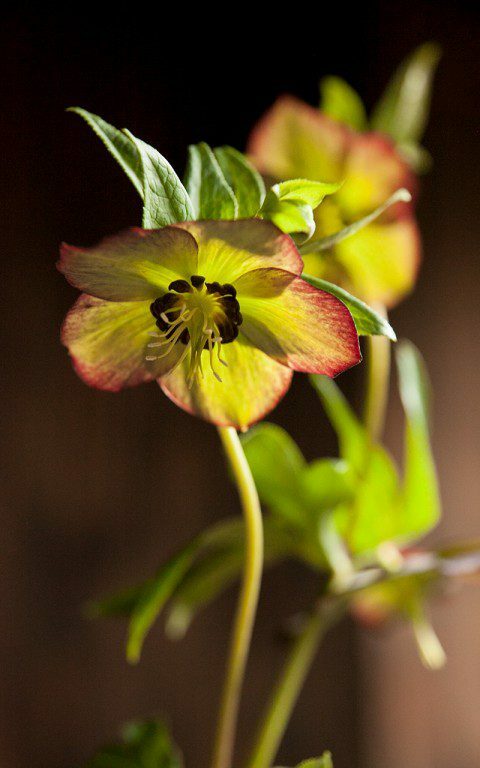 Hellebore – Dig Delve – An online magazine about gardens, landscape, growing & making. The Lenten Rose was one of my first infatuations as a child, rising like a phoenix from the leaf mould when little else was braving winter. We had discovered a solitary plant in a wooded clearing of our derelict garden and, though it was nothing special by today’s standards, it had survived the forty years of neglect that had finally overwhelmed the previous owner. I remember the excitement, the elegant outline of the hooded flower and lifting the plum and green reverse to reveal the boss of sheltered stamens. In the years since, the excitement of their reappearance each February has never dimmed. In fact I depend upon them as their energy gathers and pushes against the last of the winter. Close observation over time has allowed me the opportunity of getting to know them better; the places they like to be, their surprising resilience and longevity and where to use them so that they offer you their very best. I have also developed a keen eye, winkling out the ones that have been superseded in terms of colour and form, so that I am only growing my absolute favourites. 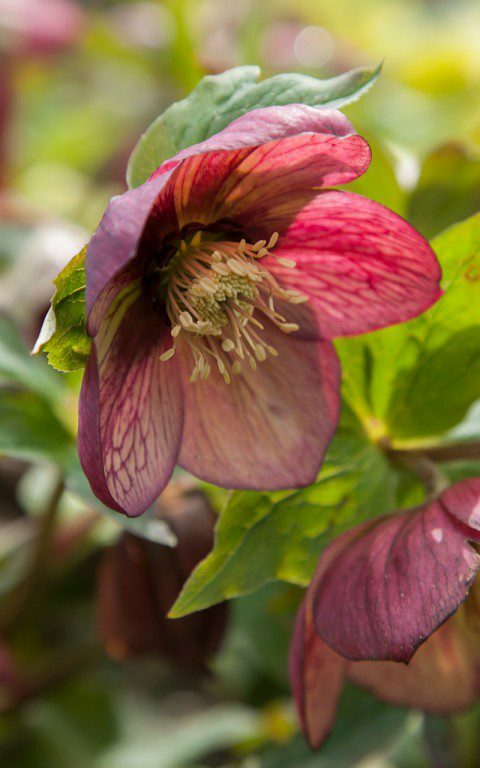 I soon learned that it was important to hand select seed-raised Helleborus x hybridus since the variability is immense once they start to cross. Seedlings take about three to four years to flower if you are up for the gamble. The colours range from the darkest of slate-greys and plum purples through mauve and then on into a complexity of reds some of which err towards the pink end of the spectrum and others into apricot or the blush of ripe peaches. The yellows, perhaps the most prized due to their rarity, are a relatively recent development. The best hold a strong primrose for the duration of flower, whilst others fade to lime-green. The whites vary too, some clean, some limey, whilst others are infused palest pink. These base colours are sometimes overlaid with delicate veining or picotee edges of a darker tone, whilst the reverse may differ from the interior with a dusting of bloom or staining that gives away nothing of the world within. 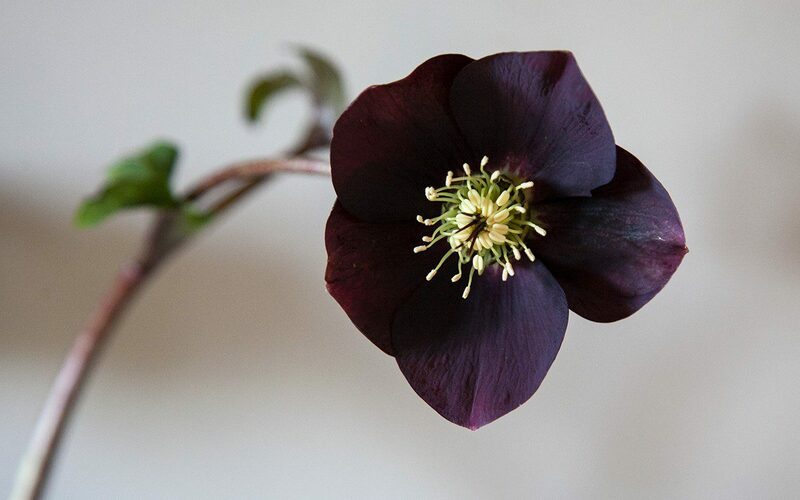 This is the stuff of obsession once you bend and cup a flower between your fingers to reveal a flash of another colour, a myriad spots or ink-dark nectaries. 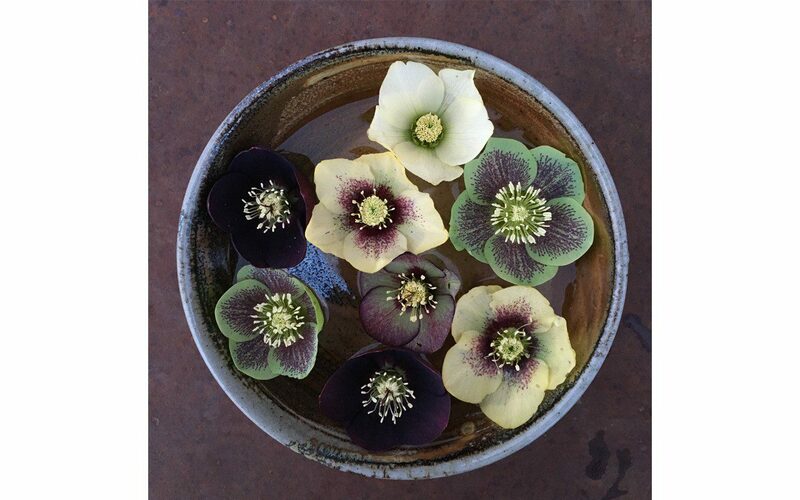 An ark of hellebores came here with us from the Peckham garden. Planted on our south-facing slopes in the shade of a trial bed of shrubby willows, I expected them to struggle, but with summer shade they have loved the rich, deep ground and took some moving when they were relocated to their final positions the autumn before last. 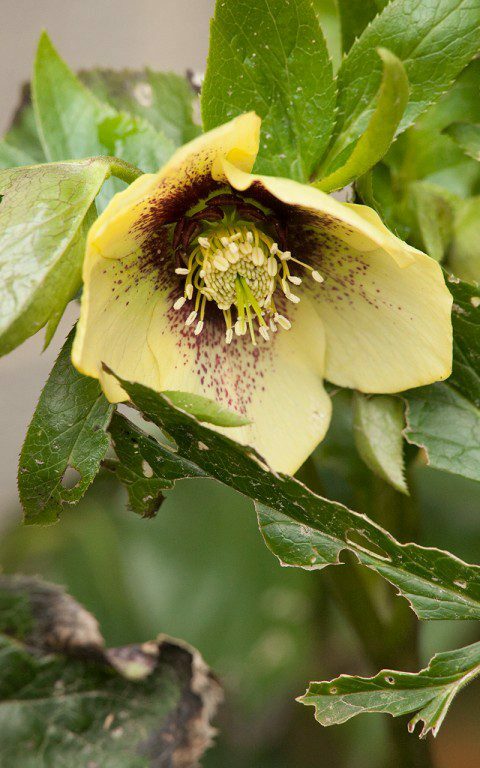 Moving Lenten Roses is easy if you do it in autumn, ahead of their period of main root activity. This is also the time to split your plants if you want to propagate a particular form, so that by the time they are pushing flowers they will have already found their feet. The plants I brought with me were old favourites I have collected along the way. A purple as deep as damsons (main image), a slate-grey with bloom to the reverse and a particularly lovely green that has a freckling of burgundy spots within. I grew them all together in Peckham, the green lifting the darkness of the plum and a smattering of snowdrops to light them still further. I also have a fresh, clean white from Home Farm with green veins, and a creamy white picotee rimmed with deep red-violet and veined within. I parted with the dull reds and soft pinks once I’d visited Ashwood Nurseries and encountered the next level. It was February, we had just had our offer accepted on Hillside, and the combination of winter weariness and the prospect of new ground inspired the journey to Ashwood. 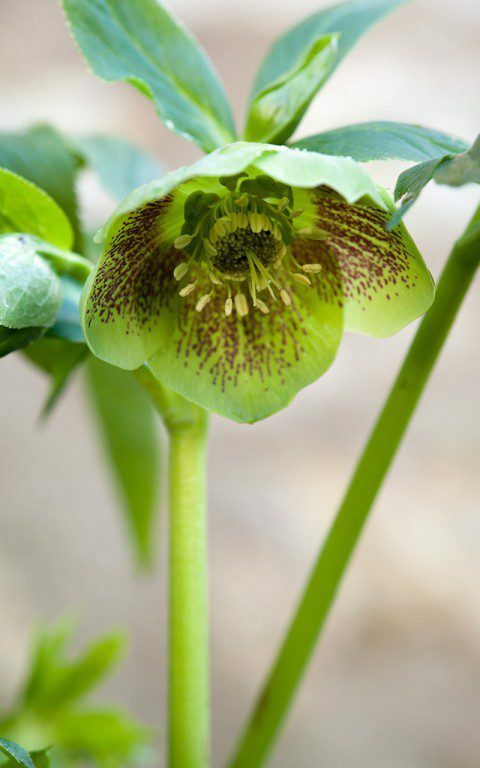 The nursery is famed for its hellebore selection programme and, within minutes of arriving, it was clear that these plants were far superior. The picotees were more finely drawn, pure whites overlaid with the merest lip of sugar pink, and there were pink and apricot picotees of even greater complexity. After several hours careful deliberation I came away with a number of yellows, selected for their dark plum nectaries, and some clean whites with the same interior stain. In the years since, I have added to the collection with green picotees, yellow spotteds and a number selected specifically for their veining. As I do not have the luxury of shade, their favoured habitat, I have been winkling my collection in under shrubs or alongside tall, summer perennials that will throw them into cool when their foliage needs protection. Our slopes, however, are ideal for close observation and being able to look up into their blooms is a definite benefit. I have them grouped according to colour, the yellows and the whites alone and the greens and the darkest forms together. Under the medlar I have a collection of deep reds and warm-toned picotees to avoid the collection feeling too much like a sweet box and to allow me the opportunity of stumbling across something different as I move about the garden. Though I am not a fan of the doubles – they feel too cottagey here and too fussy in general – I do have one that is slate-grey which makes the flower very graphic and reminds me of a Louis Poulsen lamp. It has a place of its own under the wintersweet, where I can visit with a different mind-set. 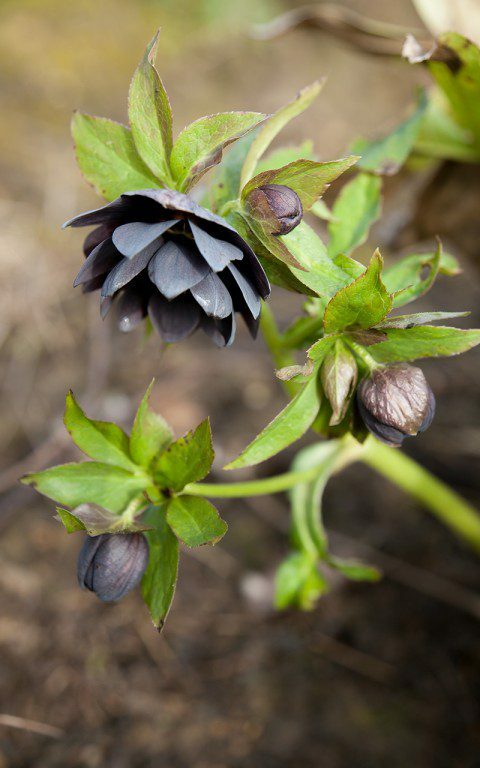 The Lenten Roses are sometimes affected by a blackening on the foliage caused by hellebore leaf spot, which can be debilitating if it gets a hold. Best advice is to remove the foliage in the early winter and burn any affected leaves before the flower stems appear in January. I prefer to let plants settle in for a year or two before removing any foliage, but stripping them back does allow you to see the flower against a clean backdrop. Mulching after the leaves are removed also helps keep the plants moist, but basal rot can be a problem in damp years, so I prefer not to mulch right around the growth to keep the base airy. For the first time this year, we have been plagued by mice which have stripped the buds of the earliest flowers and robbed me of this year’s respite from the last of the winter. The discovery left me fuming, but there are just enough to pick and float in water. 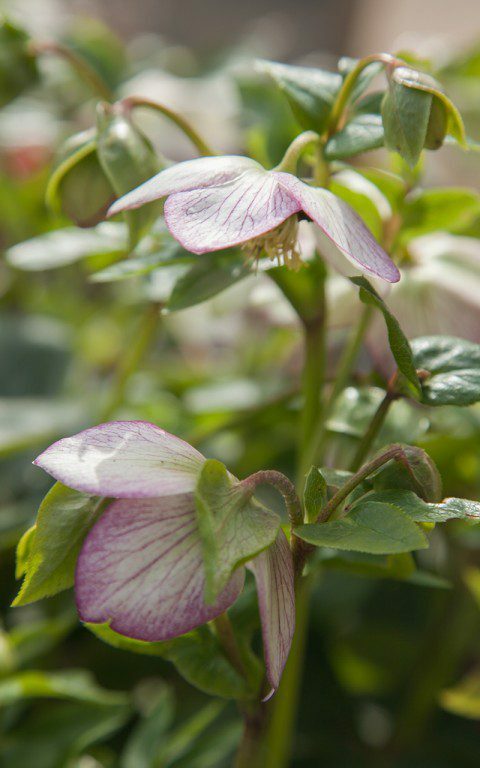 The Lenten rose is not a good cut flower, but the stems are less prone to the flagging if you steep them for thirty seconds in boiling water. We prefer to float the flowers like boats in a shallow dish of water where you can savour their interiors and appreciate the gift they provide in these last few weeks of the season.